Wanted to share a few plates and activities from my day with you all. I started off this morning with breakfast – whipped banana oat bran. I also had miso soup. 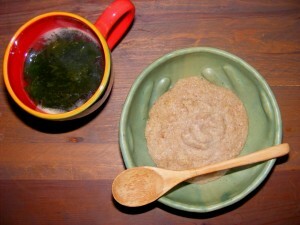 This is a pretty macrobiotic breakfast – especially the soup! I did do some Morning Yoga from YogaDownload.com, which was nice. I am never disappointed by their podcasts. In other news, the sweet Kailey at Clean Veggie Eats gave ma a Kreativ Blogger award. Check out her blog – she is an incredibly passionate and intelligent young lady and I’m proud that she passed this award on to me! Bobby and I had the nicest do-nothing night. We just chilled, ate dinner late, went to Whole Foods, and came back to our clean apartment. Our friend came over and now we’re just hanging out. Tomorrow Bobby is going to San Francisco to volunteer at a comic convention (nerd! ), which I don’t do… so I’m on my own. I’m thinking a yoga class, painting my nails, napping, reading, and making yums. Then we’re going out to eat when he gets back from the city. What are your Saturday plans? that’s a overload of kabocha..which is great!!! I wish I allow myself to do it more often. 😀 But I did have some small intake of it, I made kabocha fries for the first time using the method that you told me, and it turn out fabulous!!!! I can’t believe I didn’t try it before, it’s so easy and soooooo good. Thank you!!! Love your oat bran meal!! Mmm, I love the oat bran in this post! Oh wow, delightful eats Maggie! I follow your blog, but have never commented. I saw you were trying to decrease your dairy and I just became vegan this year, so I wanted to give you my discoveries. Parmesan-brand called “rawmesan” made with nutritional yeast, cashews, etc. Milk-any nut or seed can be milk, and its the easiest thing to make. Don’t be afraid! Pepita milk is amazing and cashew milk can be used as a creamer. Eggs-combination of avocado and tofu with nutritional yeast is insanely close to “cheesy eggs” try it! Hope I told you something you didn’t already know. Good luck! I love seeing all your eats. Do you always eat 3/4 cup oat bran at a time. I’m still obsessed. Sent my husband to Costco today for our weekly fix, and I told him to get bananas. NEVER buy them, but I want to try them in oat bran. Oh my, ricotta, pb2 and brown rice syrup? Yum? I love relaxed Saturday nights like that 🙂 I am intrigued by the rice cheese! Rice? Good. Cheese? Good. Seems like there’s nothing not to like about it! I’ve never tried kabocha, but it looks so good! My Saturday plans include studying, possibly some shopping, and hopefully a fun dinner! Congrats on the award! I learn so much from your blog! Oooh I like your use of ricotta! I’ve never mixed it w/ PB. I love how you eat your bowl of oats with a wooden spoon. I have this slight obsession with wooden kitchen gadgets, utensils etc, even though I hardly own any. I really need to get some, food just seems so much more fun to eat with wood! KABOCHA. My favourite! Love those wontons too, they look SO good. Your Saturday sounds nice, relaxing, and perfect. Mine has been pretty similar, just hanging around and making some fun foods! Enjoy your weekend! Everything looks so yummy! I wanna start doing yogadownloads but don’t know which one’s to do. I’m prettty beginner like cant do any of the cool stuff but I want to get some good stretching in for like 20 minutes or so. Any recommendations? Did you know BnPB comes in low sodium too? Have you seen that or tried it?